The best leaders are able to figure out what risks are worthwhile to take and are likely to pan out in positive ways. They know when to stay the course and do not have any problem disappointing those who wish they would move things in another direction. This skill of knowing when to fold them and when to hold them throughout the year is infinitely more important than the ability to make a sweeping change at a designated point in time. Consider the leader from a large tech company who listened with interest to the points of view of those on his leadership team as well as those throughout his business. He conducted town halls with entire divisions, had breakfast meetings with high potential performers, held one to one meetings with key leaders and spent agreed upon time every other week with his executive coach (who happened to be me) testing his assumptions and instincts around how to deal with both the mechanics and the dynamics of his business. He acted with courage throughout the year to deal with issues before they festered. He chose to share with others what was on his mind concerning the business and the external environment and he also revealed what was rooted in him that caused him to see situations as he did. This led to real exchanges and dialogues and he found himself gaining in effectiveness, as did those around him. The feedback of others was important to him and he learned to use that input to identify new priorities and sustain existing goals. Over time, he learned how to make adjustments “on the fly” so that those people connected to him at home or at work could see in him his commitment to shared goals. Together, important calibrations in leadership, organization design and talent management began to occur at work and he found more joy and success in his personal relationships as well. As discussed throughout the book Shockproof: How to Hardwire Your Business for Lasting Success, this leader knew that achieving important goals begins with small wins that can begin at any time. By calling an adjustment in the alignment of priorities, work and people a resolution, the associated action turns into an event rather than a continuous improvement process. Events are characterized by a beginning and ending, while a process is looped, continually repeating and improving, over time. When was the last time you and those closest to your personal or professional life sat down and talked together about what you are creating together? Do you need to slow down, set aside your ipad and phone and have a real chat about where you are headed and how you are going about getting there? Are there members on your leadership team who are out of whack with the culture you are committed to creating? Have you been wishing and hoping that they would change, or turning your head the other way, talking yourself into believing things are not that bad? Do others drag their feet when change is needed, finding a multitude of reasons why the change should not happen? Are you certain that they need to make it happen anyway but have been remiss in being straightforward and clear about your expectation? Is there someone in a key role who is struggling with what needs to be accomplished? Have you begun to gang up on him or her when there may be a way to help everyone win? Are you imagining that others are “on the team” and aligned with the vision without objectively exploring their levels of commitment? In what ways does your need to believe that all is well set you and your business up to fail? Are you carrying with you strong beliefs that need to be reexamined if true collaboration and shared successes are to be realized? What are your life issues, the patterns in the way you interact and live your life that follow you around, and that get in the way of you having the kind of interpersonal and business success you desire? What are you doing that is out of sync with your professed goals and beliefs? How can you be more congruent with your desires? Are you balanced in looking out and looking within? Do you seek to understand before being understood? Are you able to inquire and listen with empathy as easily as you can advocate a point of view and seek to be heard? What is the last thing you learned that helped you to grow as a person? What did it feel like to gain that new insight? 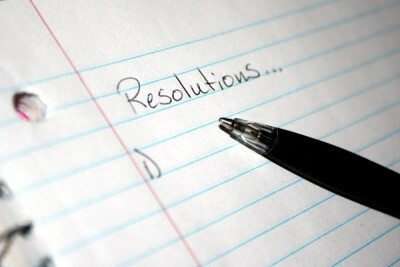 Resist the urge to set new resolutions this year. Instead, revisit the higher-level goals that are already implicit in your personal and leadership life. Reaffirm your values and the future you envision for yourself and others. Day by day take those little steps that will help you and others to live your life and run your business in ways that line up with what you want to achieve. Good luck and get started right now.